Let me start off this blog post by stating I am not Nicholas Cage. That being said 6 years ago that scene from Con Air came into my mind. 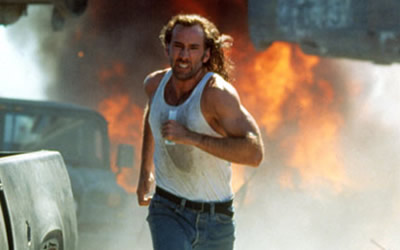 You know the one where he is running from the explosion in slow motion – great stuff and a terrific movie. You see when I was working in a laboratory 6 plus years ago a similar bomb went off in the lab. Ok, there were no flames and instead of a slow motion Nicholas Cage there were girly screams from me. One of the lab staff mixed Acetonitrile and Nitric Acid in the same waste container without considering their compatibility – remember my previous blog post on wheelie bins… is this all beginning to make sense? Good! So, a couple of hours later and the chemistry took full effect. Without getting into it in detail (however if you do want more detail – check out this post) a container with a closed lid was used, so nowhere for the container to vent….BOOM! Luckily we were all in writing up results from testing, and upon inspection a waste container was after blowing across the laboratory, spraying acid and other nasty chemicals all over instrumentation rendering the lab completely useless. Upon inspecting the bottle there lay the second problem – the container was labeled with black marker and the contents off the bottle washed the writing off the container, thus what had exploded could not be identified there and then. Upon looking at the other waste containers a decision was made to evacuate the lab because the lab couldn’t stand over what had been disposed of. This was an absolute disaster reverberating throughout the supply chain of the organisation (no lab to test product meant that it couldn’t be released meaning patients were the ones needlessly suffering). Let’s bring this back to the Waste Framework Directive and see what was contravened. Number one the waste was not being tracked. Two, no appropriate labeling system was in play and three “cradle to grave” traceability had been compromised. Additionally, lab staff were out in harms way and there was significant capital destroyed. I’m going to discuss in my next blog other examples where other labs had “Con Air” moments, but weren’t so fortunate like me. The Waste Framework Directive – What is it, why should we care & why am I blagging on about green, black and brown wheelie bins? © Aphex 2018 | All Rights Reserved.